Q. "What is the difference between wood chips and wood chunks?" Q. "How do I prepare my wood chips or chunks for use in my grill or smoker?" Q. "I previously purchased some of the Sugar Maple wood chunks and noticed that despite storing the wood in a cool, dry, dark place, the wood appeared to change color. Is the wood still good?" Q. "If I purchase a mixture of wood chunks or chips, are the woods labeled?" Q. "How much wood should I be using when I smoke or grill?" Q. "How do I smoke on a gas grill?" Q. "How do I smoke on charcoal grill?" Q. "Is there any way to smoke without purchasing a smoking wood chips box or owning an actual smoker?" Q. "How do I use the [Fire Starters|Fire Starters]?" Q. "What is the difference between an Single and Double Filet wood chunk?" Q. "Why do you only sell your products by volume and not by weight?" Q. "You seem to have a good source for a large number of hardwood species but I never see where you have any fruit woods available for purchase?" Q. "What is Ash wood good for? I've never heard of cooking with Ash." Q. "When I place an order, how quickly will my order be processed?" Q. "What are the risks to using firewood for cooking??" Q. "How much cooking wood product do I need?" Q. "There are other cheaper products available in my local box store and even online. Why should I spend more on your products?" Q. ""You only use heartwood for your products but I really don't understand what that is. Is there a difference from other supplier's wood?" Q. "What is the difference between wood chips and wood chunks ?" A. Wood chips are small pieces of hardwood that provide for quicker combustion of the wood to release the smoke vapor to naturally flavor foods exposed to the smoke during cooking. At SmokinLicious®, we developed a variety of wood chip sizing to be ideal for the various equipment on the market today, including the new popularity in hand held food smokers (see our Blog article http://www.smokinlicious.com/blog/?p=530 for additional information). Our wood chips are from freshly harvested trees; they are never kiln-dried and never contain bark. As a general rule, if you plan to smoke for only a short time, or if you desire only a small amount of smoke flavor to your food, then using a wood chip product is ideal, as this product will give you more control. Keep in mind, that many electric and gas smokers on the market today, are only designed for use with wood chips. By offering 3 key groupings of wood chip sizes (Grande Sapore®, Minuto®, and Piccolo®) Minuto Chips, we can ensure maximum flavor from the wood products and a perfect fit for your equipment. Wood Chunks are large pieces of hardwood designed specifically for equipment that has a wood pan, drawer, or firebox. At Smokinlicious, we offer two specialty cut "filets": 'The Single' which consists of wood pieces 3-4" wide that have been fileted one time for flavor release; and 'The Double' which consists of wood pieces of 2-3" wide which have been fileted twice allowing for maximum flavor release. Our Hickory in either single or double filet is a great choice! SmokinLicious® also offers "blocks" and "logs" which are considered "unfileted" cuts of heartwood that allow for extended smoking time. If you should have questions as to what gourmet wood is compatible with your cooker, see our "Match Your Cooker"? page - simply select the manufacturer of your unit, find the model, and the appropriate gourmet woods are listed for you! Q. "How do I prepare my wood chips or chunks for use in my grill or smoker?" A. Whether you choose to use wood chips or chunks, or any of our other wood products, we design the moisture level to be ideal for wood-fired cooking techniques. That means, are wood products are ready to go. There is no need to soak the products as soaking will only require more energy from the fire to steam out excess water. Remember, we are not a kiln-dried product meaning we have not depleted all the water from the wood. Kiln-dried woods tend to burn quickly and at a very high temperature. Once wood has been harvested, it will continue to loose moisture in what is referred to as the seasoning process. At SmokinLicious® we take a moisture reading on all our chip, chunk, block, and log products at the time of packaging. We scribe this reading on our packaging to assist the user in determining how to use our gourmet woods. Unsoaked wood chips are an easy way to bring the temperature of a cooker up quickly, while still adding natural flavor to your foods. You never want to apply wood that is dripping wet. Need further information on rehydration of woods, simply click on the pages titled "Importance of Moisture" and "Moisture Table" to further guide you! Q "I previously purchased some of the Sugar Maple wood chunks and noticed that despite storing the wood in a cool, dry, dark place, the wood appeared to change color. Is the wood still good?" A. Yes - we harvest our Sugar Maple from the maple syrup producing maple tree. Generally, that requires us to harvest the wood between the months of June and January, in advance of the annual tapping of the trees for sap. Although we do not tap any of the trees we harvest, they are still a sap producer. The Sugar Maple hardwood will change from a light tan/blonde coloring to a deep brown/light gray coloring due to the seasonal change of the wood as influenced by the sap. There is no change to flavor of the wood even with the color change. Q "If I purchase a mixture of wood chunks or chips, are the woods labeled?" A. Yes - we always package each wood species between a cardboard divider and label each section. Please note, that we pride ourselves as the only cooking wood company that offers you up to 3 wood selections in the single carton purchase. Just be sure to select "Mixture" from the dropdown menu of choices and not your desire woods. A. There is no single answer to this question but let us provide you with some guidelines. Natural grilling or wood fired grilling, is the process of imparting the natural flavor of wood into your meats, poultry, and other food items. If you have a charcoal grill, start the fire as you normally would. Be sure not to over fill the charcoal or burn area. Keep in mind, you will be adding wood pieces to this fire so don't over fill the basket or kettle area. Let all the charcoal catch fire and reduce itself to burning embers. You'll know when the charcoal has reached this stage by the color of the embers - they will appear grayish-white. At this point, you are ready to add wood. We recommend using between 4-8 ounces of wood. As soon as the wood is added, you should see smoke begin to develop. Add your food to the grilling grate at this time. This allows you to capture all of this natural flavoring into the foods being grilled. If there is a hood to your grill, lower it during the cooking process. This will ensure that none of the wood flavoring escapes from the cooker. Add additional wood chips or wood chunks as needed to maintain the flavoring and temperature. If your cooker does not have a hood then be sure to have additional woods available as the level of oxygen entering the cooker will reduce the woods to ash at a faster rate. A. Absolutely!! The easiest way to make a container for the smoking wood product is to use aluminum foil. Simply take a large piece of aluminum foil (roughly 6"x18"), fold it in half, and fold in each side, leaving an opening on one end. Place your Wood Chips inside, and fold over the last edge to seal the pouch. Slice two slits about 1-1/2" in length just off the center of the pouch, on the top only. This will allow for the smoke to escape and penetrate the food above. Remember, the aluminum pouch should be placed above the burners of a gas grill but under the grilling grate, or on top of the simmering charcoal briquettes. You can also place wood chunks (usually our double filet size) directly to the diffusers of the grill. And for those who truly want it simple, you can purchase inexpensive disposable foil pans like the tart size or small loaf pans and use those as well. Just place on the lit side of the grills so the chip pan is exposed to the heat. Q. "How do I use the Fire Starters?" A. Our Fire Starters contain a mixture of wood shavings and wax that allow for quick lighting of wood fires. This includes starting fireplaces and wood stoves! Stack the firewood tepee style, log cabin style, or any stacking method that has worked for you in the past. Set the Fire Starter on top of the wood and light the burlap wrapping. Our Fire Starters are designed to burn slowly for approximately 10-15 minutes. As the Fire Starter burns, the contents will cover the wood beneath, thus igniting the wood below. Our Fire Starters also work when placed on a single piece of wood. Q. What is the difference between a Single Filet chunk and a Double Filet wood chunk? A. At SmokinLicious®, we offer two custom cuts to our hardwood Chunks Double Filet wood chunks which are smaller chunks of hardwood approximately 3" in length and 2" thick and wide, and Single Filet wood chunks -hardwood chunks that are 3" in length but wider at nearly 4". The choice of Single versus Double Filet chunks is dependent on the make of the smoker and size of the firebox. For off-set style smokers, Single Filet wood chunks perform exceptionally well. For smaller smokers like the Weber Smokey Mountain®, Big Green Egg®, Primo®, Brinkman®, etc., the Double Filet wood chunk is recommended. See Matcher your cooker? Regardless of your selection, you can be assured that both variations of wood chunks are derived only from the heartwood of the tree. Q. Why do you only sell your products by volume and not by weight? A.The simple answer is that we CAN'T LEGALLY sell by weight! The National Conference on Weights and Measures -Uniform Regulation for the Method of Sale of Commodities, has very specific regulations regarding the sale of Stove Wood or Flavoring Chips. Regulation 2.43. (a) specifies that Natural wood offered for sale in packaged form...shall display the quantity in terms of cubic meters, to include decimal fractions of cubic meters; or cubic feet, to include cubic feet. The nature of our SmokinLicious® Wood is that it will continue to lose its weight the longer it is cut from the stump. Therefore, when the wood is initially processed, the wood will weigh more than when it is packaged for the customer. This is the natural seasoning process effecting the weight of the wood. Dr. Smoke recognizes the importance of moisture and we attempt to process our wood orders as close to the time of shipment to maximize this level. SmokinLicious® does not advertise the weight of our products. In fact, the reason that we include the shipping cost into our prices is to eliminate this as a concern for our customers. If you find products on the market that are selling by weight, we strongly recommend you thoroughly investigate the product since the company may not be in compliance with the above regulations. In fact, if you locate a product in plastic bags and there is no moisture in the interior of the package, it could indicate that the product could be too DRY for your smoking application. Most products packaged in plastic must have a moisture level of less than 8% in order to prevent molding. Unfortunately, this is too low to allow the wood to combust slowly. Q. You seem to have a good source for a large number of hardwood species but I never see where you have any fruit woods available for purchase other than cherry? A. You are correct! We are located in an area that is often referred to as "hardwood capital of the world" because we have so many hardwood species native to our area. Although we do have some species of fruit wood tress growing in our area, we refuse to purchase this wood as we have been unable to locate a certified source that can assure us the trees have never been sprayed with pesticides or enhanced with a growth stimulant. We recognize that many people prefer the flavors of fruit wood. This is what motivated us to find a safe, effective way to offer fruit wood flavors without compromising our position as an organic company. The result was a line of flavor-enhanced products that are made with all-natural flavorings designed with food/cooking application in mind. It is important to remember that what you cook over is just as important as what your cooking. Try our flavor-enhanced wood chipsWood chips, chunksWoodscuit, and dustFlavored Smokin' Dust today! Q. What is Ash wood good for? I've never heard of cooking with Ash. A. You're really missing out if you've never tried Ash wood for smoking or natural wood-fired grilling! What an exceptional wood! Most people don't know that Ash comes from the Oleaceae family also referred to as the Olive family. If you've ever sampled olives from different regions than you know what your in store for with this wood. It provides for one of the longest burn times in a smoking wood and imparts wonderful light flavors that are perfect with any foods. The best part is the natural oils present in this wood that result in some of the moistest meats, poultry and fish you'll ever sample. And, Ash makes one of the best beds of coals ever! Q. When I place an order, how quickly will my order be processed? A. We process orders Mondays through Fridays on the day they are received. Generally, if an order has been placed prior to 1PM EST, the order will go out that day. We always provide the FedEx or USPS Tracking Number on the package via an email message, if an email address has been provided at the time of the order. Any order placed on a Friday after 1PM will process on the next Monday. It very important, especially if you are looking for a mixture of hardwoods in your order, to provide a contact phone number so it's easy to reach you if we should need to clarify your order. 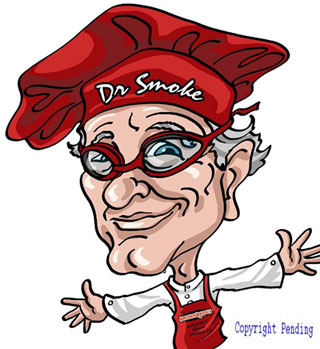 If you ever have any questions on an order, feel free to email us at info@smokinlicious.com or call us at 800-941-5054! Q. What are the risks to using firewood for cooking? A. First, you should know that firewood is designed for heat since this is the primary fuel for fireplaces and wood stoves. Many people supplement their primary home heating source with these two options in order to reduce utility costs. That being said, firewood is not cooking wood! Oh, if you go to a campground you will readily find places selling firewood for campsites along the way. Campfire cooking is different from equipment cooking. Generally, you use the dry firewood to get a very hot fire going. Only when the fire is reduced to a degree do you cook with it: using a dutch oven, elevating a grill grate over or near the fire, or using hot embers from the fire on the side for cooking. When you use firewood in charcoal/wood equipment, you take the risk of having to use much more wood than a wood that has more moisture as drier wood burns easily. That's why we love very dry wood for fireplaces and wood stoves! Dry = high heat. Then there is the matter of the bark. This is the impure part of the tree, designed to trap in anything considered harmful to the tree's survival: insects, mold spores, larvae, etc. It is the driest part of the tree so it will cause fluctuation in the temperature as it burns. When you do wood-fired cooking techniques, you want stability of temperature so bark-on is not the first choice. Also, keep in mind that there are restrictions in many states from moving firewood so be sure you check with your State Department of Environmental Conservation to know the mileage limitations. Most prefer within 10 miles of origin. Q. How much cooking wood product do I need? Q. There are other cheaper products available in my local box store and even online. Why should I spend more on your products? Q. You only use heartwood for your products but I really don't understand what that is. Is there a difference from other supplier's wood? A. All wood starts life as sapwood, the living, outermost portion of the tree that is just under the bark. Sapwood is where water and dissolved minerals are transported from the roots to the crown of the tree. Essentially, it is where energy for the tree is stored. As older sapwood cells age and die, they become heartwood, which plays no role with transport of essential nutrients for the tree. Then what are the benefits to heartwood? Heartwood is known to be resistive to insects and decay. An additional benefit is heartwood tends to be darker in color than the sapwood. Because the cells die off, the moisture level is less difficult to manage than sapwood, meaning it can be dialed in with greater ease. That’s why traditional firewood can take so long to season (up to a year) as it will contain bark, sapwood and heartwood due to the splitting of the harvested tree. The combination of these three distinct components can alter the aroma and flavor when used together in cooking, producing a more muddled flavor profile. This is where the risks for toxicity in cooking reveal themselves. One of the reasons that SmokinLicious® has specific hardwood species in our product offerings is because the hardwoods we’ve selected tend to have a healthier heartwood to sapwood ratio, are known to have less risk of heartwood rot, and have lignin percentages that are more complimenting to cooking. We’ve done the hard thinking for you so go ahead and select one of our hardwoods with confidence that you will get a super aroma and taste to your wood-fired menu items! (read additional information on this topic in our Blog http://www.smokinlicious.com/blog/?p=288 and http://www.smokinlicious.com/blog/?p=244).